Here’s a treat full of delicious Latin flavors! 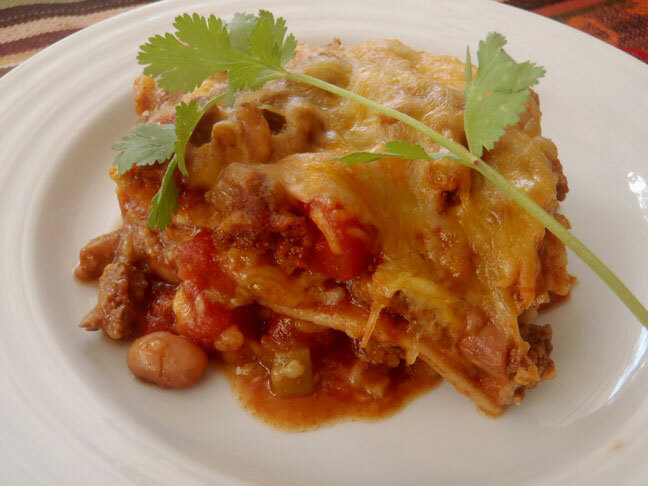 It’s a comfort food and will be perfect as the heart of your Cinco de Mayo meal! 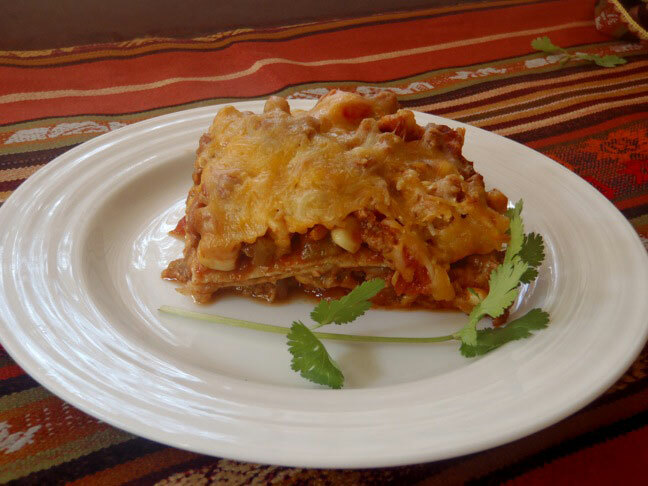 Corn tortillas take the place of the traditional lasagna noodles. 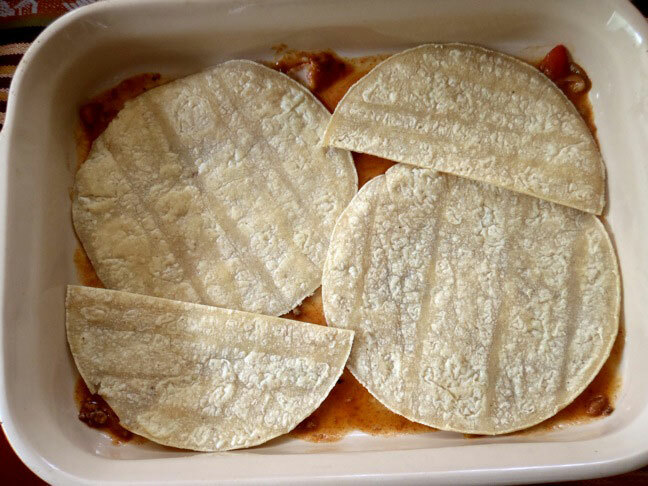 They separate layers of melting Mexican cheeses and spiced meat sauce. 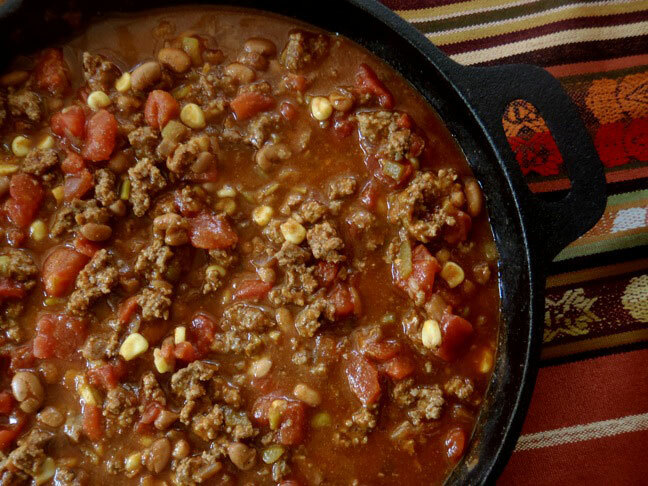 This dish is actually quite easy to make and, if you want, skip the tortillas cheese, and you’ve got a big pot of Mexican Chili! Woot! Preheat the oven to 375. Get the tortillas ready by cutting three of them in half. Set aside. Coat the bottom of a large pot or saute pan with the olive oil and place over medium heat. Add the onion and cook until soft, about 4 minutes. Then add the corn and cook until it begins to brown, about 5 minutes. Add the spices, salt, and meat and cook until the meat is no longer pink, about 10 minutes. Use a wooden spatula to break the meat into small pieces as you stir. Mix in the beans, tomatoes, enchilada sauce, and chilies. Season to taste with salt and pepper if necessary. 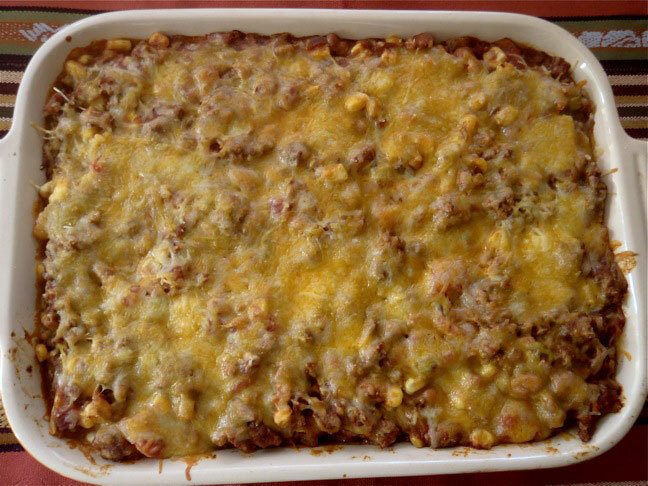 In a rectangular baking pan (approximately 9 X 13 X 2-inches), add a very thin layer of the sauce (mostly the liquid). Add two tortillas and two tortilla halves to the top of the sauce. Then evenly add about 3 cups of the sauce directly on top of the tortilla layer, followed by a sprinkling of about 1 1/8 cups of the cheeses. Repeat this process 2 more times. Bake in the preheated oven, uncovered, for about 20 minutes. 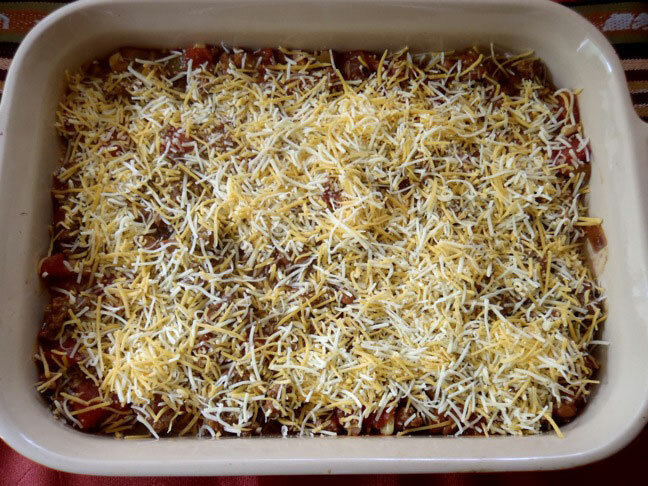 The cheese should be totally melted, and the sauce should be bubbling along the sides of the pan.